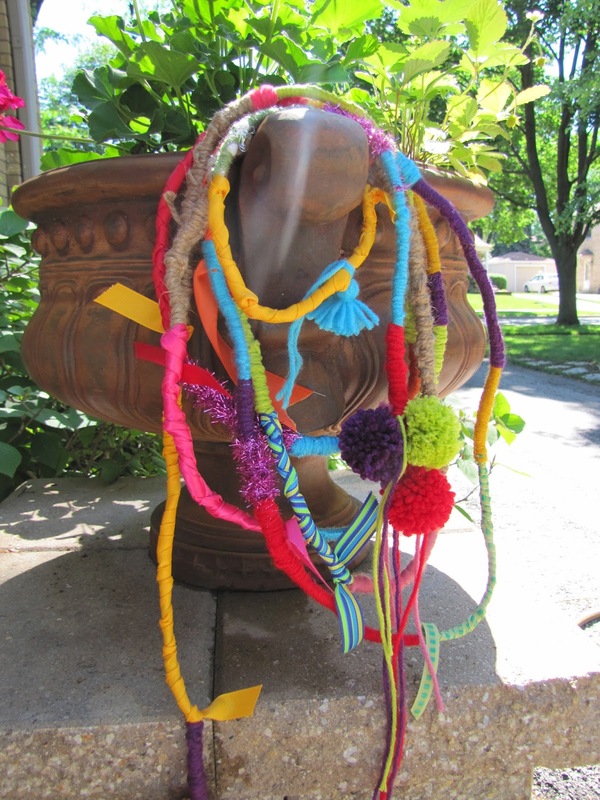 I originally made this wrapped rope project to use up lots of scraps of yarn, string and ribbon that I had laying around, taking up valuable storage space. I honestly CAN NOT seem to throw supplies away! I guess my hoarding tendencies force me to come up with new ideas to use up "stuff". At least that is what I am telling myself! Here it is all coiled up hanging on the door. I usually have it draped around the door frame in the kitchen, leading into the dining room. I tried to get a photo of it in its natural habitat, but the light was uncooperative. This is a super easy project and it is one of those mindless activities that you can whip out without really having to concentrate. All you need is clothesline, or rope. 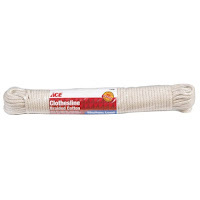 I used this one, and I got it at my local Ace Hardware. 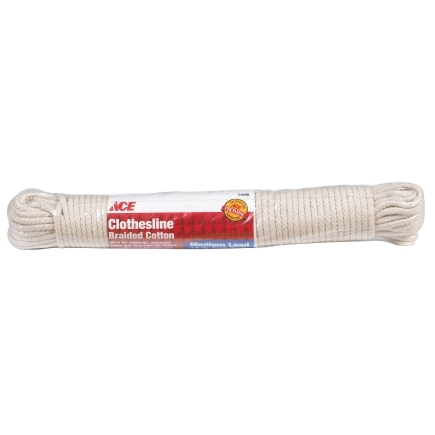 To start this project you need to cut a piece of clothesline to the length you want. This one is about 14 feet, because I want it to be long enough to hang around a door frame. Bundle the excess up with a rubber band to keep it out of your way as you are working. 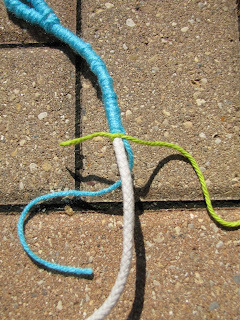 Then you just tie a piece of yarn onto one end of the rope. You basically just keep wrapping and wrapping the yarn around the rope. I like to use lots of different colors and I try to make sure that all of the blocks of color are not the same size. I also use things that are different textures, like yarn, ribbon, twine and even fabric. 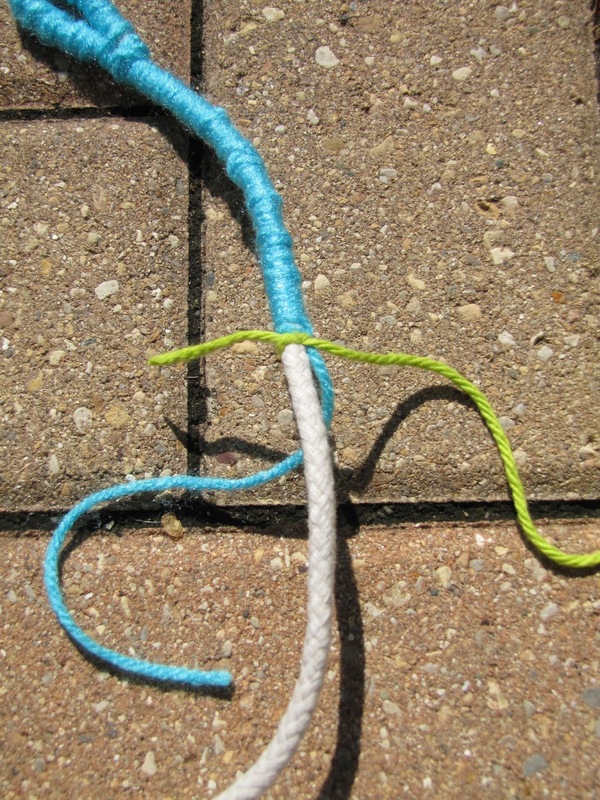 When you want to change colors just tie a simple knot, like in the picture above, then tie on a new color and start all over again. After you tie the knot to finish a color, just leave the tail and wrap the next color over it. 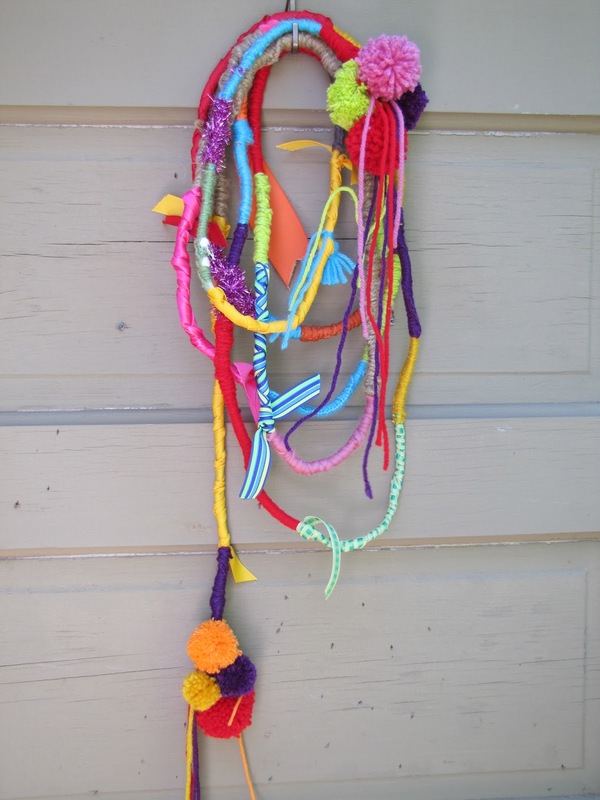 I make a loop at each end, so that I can hang some pompoms from the ends! Easy, right? When I tie the ribbons or fabric on, I usually leave a piece of the ribbon out, instead of wrapping over it. Just because I think it looks cute that way. But you could wrap over it if you wanted. Once I have the whole rope wrapped, I hang the pompoms on the ends and little tassels and bells here and there. I really can not get enough of these wrapped ropes, they are so colorful and fun. I love to hang them all over the place. I have also used them as the ribbon on packages and I even wrapped them around the Christmas tree one year. What do you think? 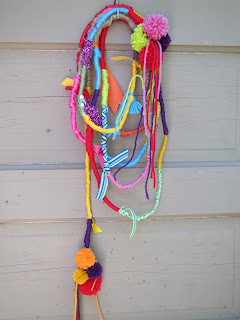 Could you find a place to hang a wrapped rope? Would you ever make one?